You might be looking at concept art, but this is really happening. I imagine the inside is a rather-looking bullet train, but damn, the outside is striking. It’s designed after Evangelion Unit-01. Don’t see it? Here’s a comparison. 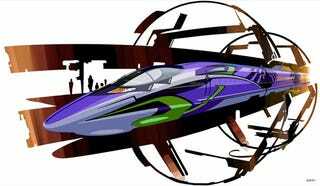 According to Buzz News, the Neon Genesis Evangelion-covered bullet train will begin service this fall from Osaka to Fukuoka. It will run until March 2017.